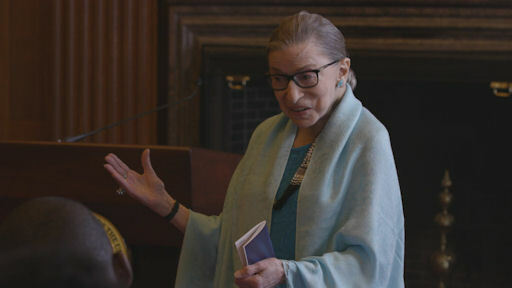 Review: RBG / It's Just Movies Review: "RBG"
Thank you, Ruth, for making sure my friends had the freedom to pursue the jobs of their passion (Marines) and could be hired irrespective of their gender (security guard). Thank you for promoting respect and equity under the law so that women cannot be excluded from publicly-funded institutions and that even men can get equal protection under the law. Your ground-breaking work is human rights at ground zero. Julie Cohen and Betsy West’s biodoc, co-produced by Storyville Films and CNN Films, succeeds in teaching as well as inspiring. “RBG” tells of Ruth Bader Ginsburg’s early tragedy, her dating life, her parenting and her devotion to justice. She comes across as an obsessive-compulsive diligent worker, as well as a lover of the opera and her family. While banned from the kitchen because she’s an epicurean disaster, she writes famously pithy, core-cutting dissents for the US Supreme Court. Despite stellar credentials from Harvard and Columbia, Ruth could not get a job in any law firm in all of New York City. Firms weren’t hiring women. This led her to work for the ACLU where she found she had to be a kindergarten teacher (her words) to authority starting in 1972. She’s been friends with Justice Antonin Scalia, who believed that the US Constitution should be interpreted the way our Founding Fathers intended. When asked how he could possibly read the minds of Jefferson, Franklin and Madison, he responded authoritatively that there is enough written to know. Ginsburg, on the contrary, asks us, “Aren’t Blacks human? Shouldn’t women vote?” The Constitution excluded both. As times and minds understand more, the law needs to reflect our growing understanding that the rights of all people should be covered under the law. So, thank you, Ruth, on behalf of my mother who needed to be allowed to open a bank account separate from my father, on behalf of the man who lost his wife in childbirth and needed support to raise his new baby, and on behalf of my dear friend who was never encouraged, despite her brilliant mind, to pursue the degrees for which she was qualified. Thank you for your ground-breaking work to eliminate gender discrimination. Seen in a packed Hollywood Theatre at a special showing presented by the ACLU, the audience cheered, laughed, clapped spontaneously in passionate support and choked back emotion. 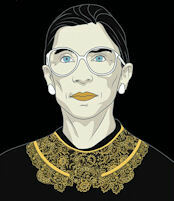 “RBG” is just as magnificently well put together as its subject. It is a film for your children and your children’s children. This is a sacred slice of history evocative of what is best about the human spirit.